One person has died and multiple structures have been damaged or destroyed in severe weather that hit Southern Kentucky and the northern portion of Middle Tennessee. Ahead of a strong line of storms expected to make its way into our viewing area Saturday evening and night, severe weather cells popped up Saturday afternoon. In Logan County, Kentucky, the sheriff confirmed an elderly woman was killed when she was hit by debris in the 900 block of Dot Road during a storm that moved through after 4 p.m. Saturday. Authorities identified the victim as 79-year-old Dallas Jane Combs. They added her husband had been outside putting plastic up to keep rain out of the home when he was blown into the basement area. He was able to avoid injury. 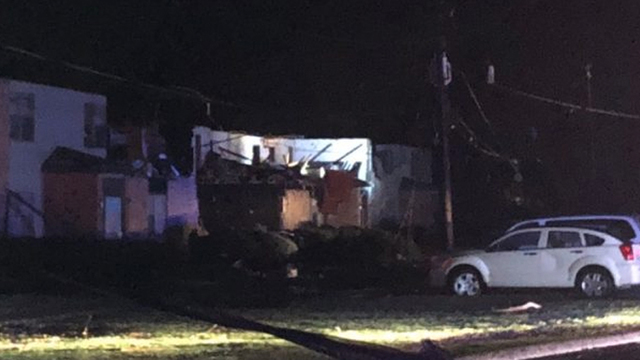 Officials confirmed at least two homes were damaged on the Tennessee/Kentucky state line on McGee Road, located in both Adams, Tennessee in Robertson County and in Logan County, Kentucky. Of the two homes, situated about 100 yards apart, the one on the Logan County side was destroyed. No one was inside the home at the time. Images from the scenes of the homes showed vehicles flipped, windows blown out, parts of the homes missing, downed trees, and a field of debris. No injuries were reported in that area. Tornado warnings were issued for Todd and Christian counties in Kentucky after 2 p.m. Saturday. Just a couple of hours later, a strong cell moved through Southern Kentucky, causing tornado warnings in Logan, Simpson, and Warren counties. It's believed that cell possibly caused the damage seen in Robertson and Logan counties. Following those storms, the main line moved into West Tennessee. With it came tornado warnings for multiple counties, including Henry, Benton, Houston, Stewart, Carroll, Dickson, Weakley, Montgomery, and Robertson in Tennessee, as well as Butler, Logan, and Warren counties in Kentucky. Multiple damage reports came in from many counties after the main line of storms moved through, including Montgomery County. Clarksville reported downed power lines and trees, as well as structural damage to businesses and homes. Two people were injured on Green Grove Way in Clarksville in a house that was reportedly destroyed. The extent of their injuries was unclear. The basketball game at Austin Peay State University was delayed due to roof damage that caused water to leak into the building. Multiple homes and garages were damaged in the Farmington subdivision. A roof was completely lifted off of a home on Rollow Lane. LifePoint Church in Clarksville on Rossview Road was set up as a shelter for those in need. Firefighters and police officers were going door-to-door to check on residents. In Hopkinsville, Kentucky, an apartment complex was badly damaged. Multiple injuries were reported at Eagle Crossing Apartments on Calvin Drive, but authorities said none of the injuries appeared to be serious. One building at the complex was destroyed and four were damaged. They were working to find shelter for tenants who were displaced. A tornado watch was issued for most of Middle Tennessee and South Central Kentucky till 2 a.m. Sunday. Keep up-to-date with the latest severe weather information by viewing the current radar and your forecast .